Italian Electric Guitar Player Gianfranco Segatto is no stranger to the St.Martin Island music scene; we've seen him perform in many bands gigs and bars.Now after working along for over 10 years with local musicians he has decide to put this experience on a memorable CD "To my knowledge is the first rock album on the Island" the hardest part was gettin the people togheter, the song writing was the easy part.........this project took about 2 years. The Cd has 10 original track and one cover track , i would say it's an hard drivin' blues album with some powerful chords and a lots ripping off rapid leads through the cd without losing the emotional aspect of the blues music. 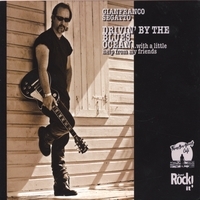 Gianfranco Segatto moved in the Caribbean from Milano Italy where he used to be a hired gun for Italian Pop Star Umberto Tozzi; Performing in major venues all around the globe for over 10 years gave him a chance to build a solid guitar playing with strong rhithms and fiery blues-based solos. This recording is solid from start to finish,and if you are into guitar driven blues/rock music with an attitude,you are certainly going to add DRIVIN'BY THE BLUES OCEAN to your wish list and enjoy a good dose of quality guitar playing. Guitar please! if you're lookin' for great blues rock, this cd is for you. the big guitar sound from Gianfranco Segatto is on top and he knows how to squeeze it! But not only the straight rockers make you smile, but also the slow blues tracks. highly recommended.